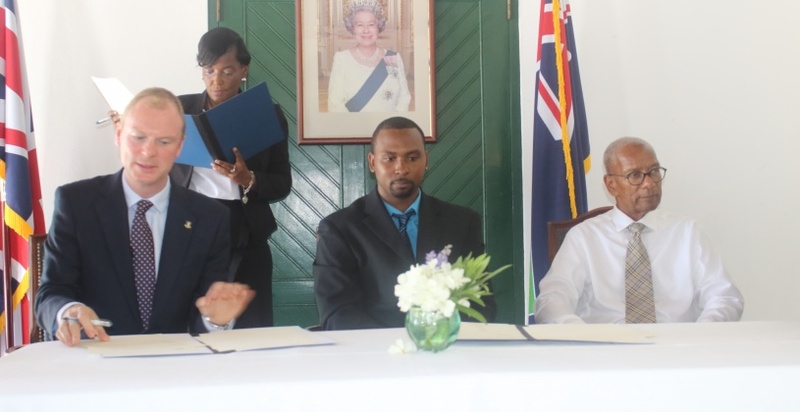 Rovika Inc, a local tech startup run by Dennison Daley and Manish Valechha on Monday signed an agreement with the Government of the British Virgin Islands to use ExcoTrack, a document management software designed for senior cabinet officials. The use of the software is part of the BVI’s eGovernment strategy to be more efficient, effective and green. BVI Cabinet Secretary Sandra Ward said her heart was warmed that they were using software not developed in the first world but from another UK OT, Montserrat. She said this would advance the processing of cabinet documents through a web-based format. Ward said back in 2015 the Cabinet office began to look at electronic processing to reduce the volume of paper. Former Cabinet Secretary for Montserrat Angela Estwick shared that they used ExCo Track. This began the process to review the software and negotiate for its adaptation for the BVI. The Government of Montserrat has been using the software developed by the young entrepreneurs since 2013. H. E. Governor Augustus Jaspert, Dennison Daley of Rovika Inc. and Hon. Premier Orlando Smith. During the upcoming week, Cabinet office staff, approved Cabinet officers across the government service and senior members of government will be trained on the use of the software. ExcoTrack allows for the preparation and sharing of policy documents centrally. It is designed to specifically meet the needs of a Cabinet office and can be accessed from any web browser and device. Ward said she was excited about the possibilities as a time saver, cost saver, space saver, and stress saver. “Decisions can be made with collaboration from technical and other key stakeholders without a single piece of paper being printed and, most importantly, Cabinet will be able to get real-time updates on the implementation status for the directives that they have issued to their ministries,” said Daley, during the official signing ceremony. Daley shared how their start was with Talypso, a judging software they developed while he head of Montserrat’s Calypso Committee. Talypso provides real time analytics and cuts down waiting time for results. It is used for music competitions and pageants. Rovika has also developed a vehicle licensing software, which provides web based access for renewals, inspection bookings, reporting licenses lost or stolen, and to review your licensing history. Daley said his company was proud to partner with the government of the BVI to work with them to enable to get closer their goals of greening the public service. H.E Governor Augustus Jaspert the public expects, efficient, effective and modern service. Paper has an impact on the speed at which the government operates and also impacts the environment. He said using the software was like getting a blood transfusion to help the body of the public service be more effective. The governor said ExcoTrack presented an opportunity for the cabinet to model the leadership from the top in a green and sustainable way, and with resilience.